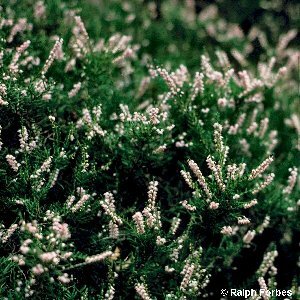 A low-growing shrubby species which is the commonest of all the heather species and which is found in acid and especially peaty soils all across Northern Ireland. The habitats include old leached sand dunes, lowland heaths, raised and blanket bogs, woodland and forestry plantations. It occurs from sea level to high up in the mountains and hills and frequently grows covering very large areas as the dominant species. It is adversely affected by over-grazing by sheep which can result in its replacement by a species-poor grassland on the hills. 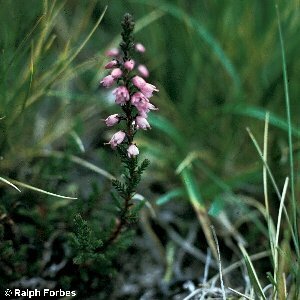 Calluna is distinguished from other heathers (Erica spp.) by having separate petals, instead of a tubular or urn-like flower of fused petals. It is frequently accompanied by Erica spp. and bilberry (Vaccinium myrtillus).